Honour guard David Carrasco, 78, stands with the flag outside the A.L. 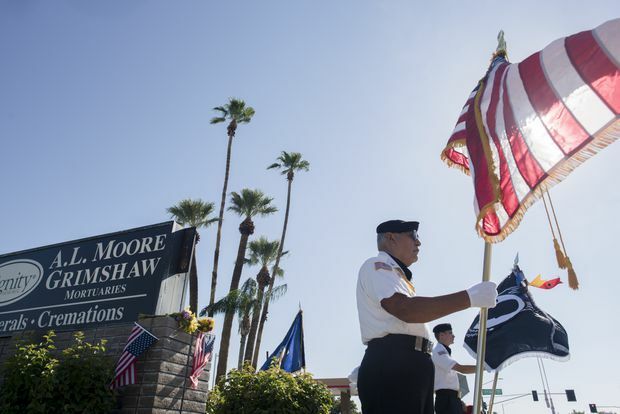 Moore-Grimshaw Mortuary in Phoenix, where the body of the late Senator John McCain is currently being held on Sunday, Aug. 26, 2018. His office said that McCain will lie in state in the Arizona state capitol on Wednesday. A funeral will be conducted at North Phoenix Baptist Church on Thursday with former Vice-President Joe Biden speaking. Arizona will accord McCain that honour on Wednesday, when he would have turned 82. “This is a rare and distinct occurrence for a truly special man,” GOP Gov. Doug Ducey said in a tweet.